Clinical introduction A 17-year-old male patient was brought by ambulance to the ED following a witnessed collapse while playing rugby. He denied any significant trauma, chest pain or breathlessness, and was alert and uncomplaining on arrival, with normal observations and a normal physical exam. Witnesses described a loss of consciousness, with a period of respiratory arrest requiring rescue breaths at the scene. Paramedics reported frequent ventricular extrasystoles on their arrival. The patient had no medical history and was on no medication, although admitted to ‘fainting’ some 3 weeks previously, again while playing rugby. A paternal uncle had died suddenly at the age of 45. 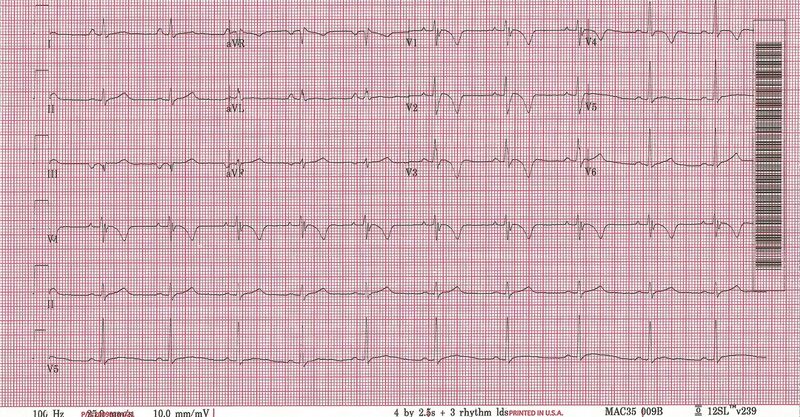 His initial ECG is shown in figure 1. Question What is the most likely diagnosis? Contributors DD assessed the patient in the ED and planned the article. DP and RW assisted in writing the article. Correction notice This article has been corrected since it published Online First. The name of the last author (Robin A Weir) has been corrected.